With the close of the first quarter of 2017, we can start culling through all of the consumer reactions to Smart Home devices they have purchased in the last three months. One market segment that is always of interest is Security Cameras. The Nest Cam and Arlo are flagship products in this category that still contains a dizzying array of brands and packages, ranging from ten camera bundles sold at Costco to individual cameras flying off the shelves at Best Buy and Walmart. The question is, post purchase, which brands are delighting consumers by delivering on the promised experience? 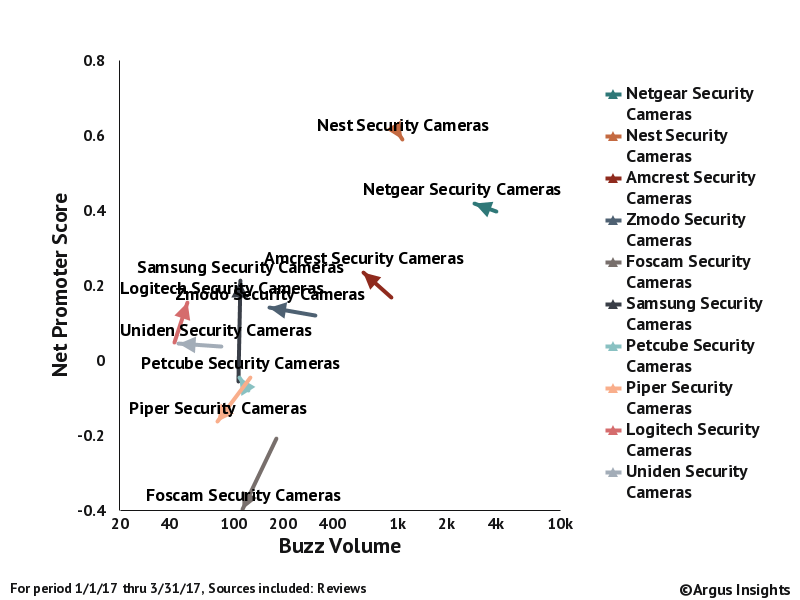 As you can see from the graph above, Nest and Netgear dominate the category. While we see demand for Nest Cam lower than the full portfolio of Netgear branded cameras, overall, Nest customers are happier with their user experience. You can see the cloud of other brands clustered in the area of lower demand and more frustrated users. Within this crowd, we see Logitech and Samsung making gains both in demand (Buzz is a proxy for demand) and Net Promoter Score. So what is the difference between Nest and Netgear for consumers? Some would argue that since Netgear makes most of the WiFi routers used to connect to these cameras, Netgear Cameras should be some of the easiest to set up, given that the initial connection to the WiFi router is a constant frustration for DIY consumers. Comparison of consumer perceptions of Installation and Setup for Nest and Netgear Smart Home Security Cameras. You can see from the Experience Funnels above (Red bars show what percentage of the reviews were negative, green indicates the percentage that were positive and grey is neutral) that Nest consumers mention the router set up more than software or any initial wiring. Overall the Nest Cam installation is a net positive experience. The same is true for Netgear. Since Netgear produces a range of cameras that compete both with the high end Nest Cam and lower end multi-camera bundles of Swann and others, you see Netgear consumers discussing Wiring and Software ahead of Initial Router Connection. While Netgear attracts more negative comments for their overall Installation experience, they receive a proportional increase in positive comments as well. In fact the Net Sentiment of Installation for Nest and Netgear is the same, about 13%, meaning that consumers for both brands found the overall experience of Installation to be positive, a key factor in driving Smart Home adoption. Interestingly, Netgear’s prowess in WiFi did not translate into a significant differentiator for Smart Home Camera Installation compared to the other market leader, Nest. In a future post, we might dig deeper and do a direct comparison between Nest Cam and Netgear’s Arlo for a product level analysis. If you can’t wait for the next post, check out our analytics platform, the Argus Analzyer, where you can dig deep into the bones of the user experience across the entire Smart Home market. You can also sign up for our free Smart Home market trend tracker, which includes basic access to the Analyzer and email updates whenever something causes the Smart Home market conversation in social media to jump.